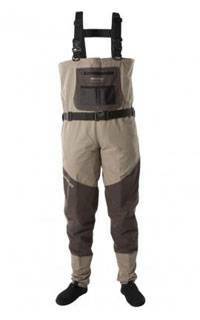 Neoprene waders have always been prone to develop seam leaks after a period of time. This is owing to two factors  the grade of Neoprene used and the seam manufacturing technique. Many manufacturers use cheaper grades of Neoprene such as SBR (Styrene Butyl Rubber), a very cheap grade of Neoprene that not only starts life less elastic then premium grades, but quickly loses its elasticity, in as little as 3-6 months. This then transfers all the stresses and strains onto the seams, rather than being absorbed by the elasticity of the material. 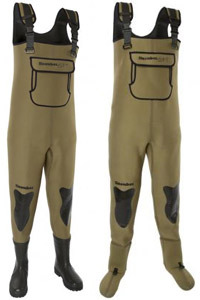 Traditionally, Neoprene waders are manufactured by buttgluing the seams together, then blind stitching the outside for strength, and heat taping the inside. When you think about it, you have a 4mm waterproof layer, which you have then punctured half way through, by the blind-stitching technique, which now only leaves you 2mm of material between you and the water! Not the greatest of ideas! Following the phenomenal success of the Chest model, Snowbee has been constantly asked for a Waist version. 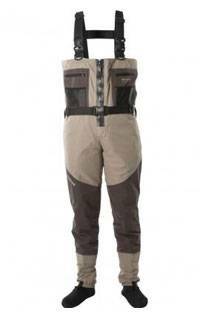 Favoured by boat anglers and small river fishers where deep wading is not necessary, the waist version offers just that bit more protection than thigh waders, for greater flexibility, when shallow wading. Similar features to the Chest model, but in a waist height. Fitted with a front fly zip for convenience, with an inner waterproof gusset and Snowbee's popular Lumbar Support Wading belt, as standard. The 4mm neoprene socks fitted to these waders, feature a completely new cutting design, making them the best fitting, most comfortable, they have ever worn. In addition to the Hypalon sole panel, which prevents heel compression leaks, this new cutting style tapers the ankles, to remove excess material, which can otherwise crease up inside your wading boots. The new 3 panel design ensures all the seams run around and not under your foot, for a more moulded fit and added comfort. The integral gravel guards have front lacing hooks and rubberised elastication around the bottom, to prevent them riding up when walking. Available in standard fitting, plus Fuller Body (FB) fitting, which is approx 15% larger on the body size. The same features as the Zip-front model, but in a standard chest style. 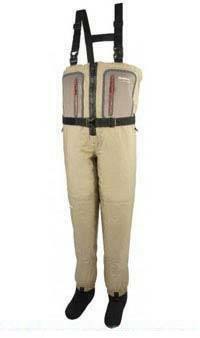 This new model offers the very best value for money of any breathable wader on the market. 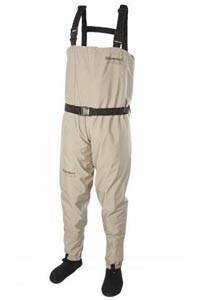 Snowbee's Ranger Breathable waders offer superb performance, coupled with light weight & outstanding value for money! The Ranger Wader range uses a quality 210 denier Taslon nylon upper material, laminated to their reliable, high performance Vapour-Tec breathable membrane, with a Tricot inner lining. The conventional stockingfoot chest model features a front flap pocket, 4mm Neoprene socks, built-in gravel guards, with lacing clips, plus an adjustable webbing wading belt. The fully adjustable webbing braces feature a rear elasticated section for comfort when bending down and are fully removable if required. The brace clips are reversed, so you cannot get them crossed and they can be clipped together, so the waders can be rolled down into a waist wader, if required.  D-rings on belt loops for wading staff clip etc. The same features as the bootfoot model, but in a stockingfoot design. The 4mm neoprene sock uses a unique 3-panel design, so no seams run under the foot. The shaped foot design avoids slack material inside your wading boots, for additional wading comfort. A Hypalon sole panel prevents compression at the heel area, which can cause leaks. Integral gravel guard, with front lacing hook. The new Stockingfoot model is now available in an extended size range, including FB (Fuller Body) plus new LONG fittings, to cater for all shapes and sizes.